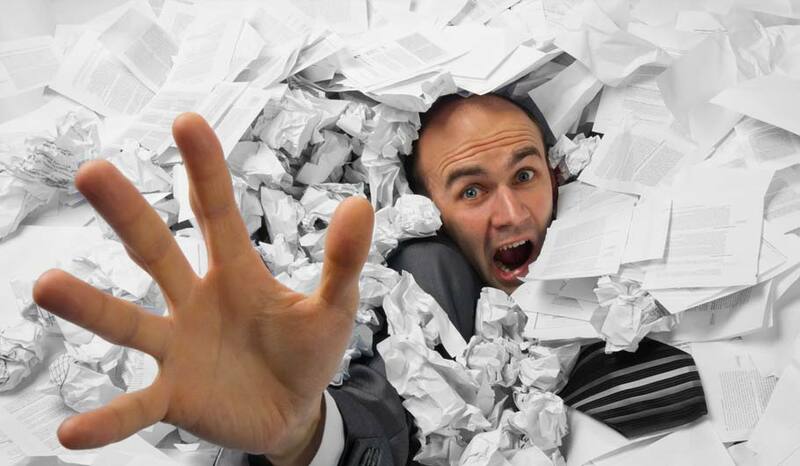 Drowning in Paper? There's a Better Way! The first person in the history of the world to be involved in shift scheduling was a guy named Grank. He was responsible for making sure that someone was always tending the fire; keeping it burning all day and all night. This task was vital. Keeping the tribal blaze lit was a core function of the group since making fire before Zippos were invented was a colossal drag. Also of prime importance was the fact that the round-the-clock campfire kept predatory saber-tooth mammoths at bay. Saber-toothed mammoths tended to reduce the organization's workforce unexpectedly and replacement staff was hard to come by before the advent of staffing companies. With so much riding on the fire picket position, Grank made sure that the person scheduled for CRM (Campfire Refuelling and Monitoring) duty was proficient at the task. He ascertained his manpower choices were armed with the appropriate skill sets for the task, (namely, the ones on night shift were insomniacs who could be counted on not to doze off and let the fire go out or be eaten by something) as well as armed with a club in case of a security issue. Grank had just three tribesfolk with the skills, training and vigilant attitude required to perform the task with diligence. With just three members of the task group and three eight hour shifts to cover, Grank knew he had only six possible shift configurations to contend with. He also knew if they conducted job action to reduce their shift to six hours per day, he would need another caveperson to assign to the task group which would mean 24 possible combinations of shifts. Six shifts/day would mean 720 possible combos and eight shifts of just three hours each would mean 40,320 different potential shift schedules available. Shift scheduling, Grank realized with his proto-business acumen, was a complex matter indeed. Keeping an eye out for danger proved to be a popular use of shiftworkers as we became more civilized. The job class of "Lookout" was given to staff members who stood guard at castle turrets as well as in the crow's nest of mighty ships; both requiring staffing on a 24/7 basis. Being willing to work shiftwork had become a ticket to world travel. However, the task entailed another specialized adaptation; great day and night vision without any visual aids, since such things as eyeglasses, ophthalmologists, and vision-care benefit co-pays had yet to be invented. Adding in the vital skills of 'good day vision' and 'good night vision' which were not necessarily manifested in the same people, meant that scheduling had again become incrementally more complex. Suddenly, shift scheduling offered greater challenges than they had when we just had to monitor a fire. The first officer for guys like Christopher Columbus and that Amerigo Vespucci fellow had to make sure every shift was covered with someone whom would not only stay awake and alert throughout their shift but also be able to see long distances, even at night. The Industrial Revolution saw the role of shift scheduling really blossom and come into its own. However, the number of aspects that the scheduler had to juggle rose exponentially as skill sets required to do certain jobs became more and more specific and complex. Suddenly, staff needed more talents than simply staying awake and seeing far away. They had to know how to run a machine and have the strength to provide the motive force for actuating it. Staying awake was still a much sought-after trait, however, as most companies using these new-fangled machine-thingies quickly realized the benefits of having their production run 24 hours a day. Thus, the twelve hour shift came into being. Shift schedulers had to work out the most efficient method of keeping the wheels of industry turning with ideally, the least amount of people dying from being overworked. This was important for retention purposes, a factor still of concern to schedulers to this day. Eventually, after the invention of such elements as computers, algorithms, spreadsheets and labor laws, shift scheduling software finally became a thing. These programs provided a simple way to populate a set of shifts to cover most work environments. It could manage far more than just the 40,320 possibilities of an eight person rota and could keep track of hundreds, even thousands of employees. It was almost like a shift scheduler's dream come true. Almost. In time, shift schedulers found that even as powerful as these software products had become, there were still gaps in what they could do. Nowadays some select shift management software products have moved beyond the simplistic models that became prevalent in industry. These ground-breaking, powerful programs could factor in far more aspects than ever before, as well as providing warnings of potential crew shortages of, not just manpower, but skills, certifications, hard assets such as equipment and technology required for a specific job and ensure everything falls within union rules to avoid job actions. Besides these attributes, depending on the industry, a totally separate, quickly deployed Rescue Crew always on standby is also a legal and moral requirement. This factor is especially true in the oilfield and energy sector businesses who are often involved in below-grade jobs, working at a height and performing tasks in confined spaces. No human could possibly keep track of all these factors which make the new, more complex shift scheduling software a necessity in our equally new and increasingly more complex employment landscape. When selecting manpower deployment software, it is critical that it can encompass every niggling detail that the old school systems failed to factor in. It is vital to ensure whatever product you decide on, it has all the capabilities and algorithms to handle every permutation you may face. Visit the ShiftShaper Shift Scheduling Software website here. When evaluating the shift software product you will adopt, it is absolutely crucial you are certain it will encompass every factor that is in play in your business and that it has the algorithms built in so that you are always forewarned of any possible looming shift staffing issue. Doing only most things right is no longer good enough.